Stunning Keisha: Quién Es Más Precious? I guess it’s no secret who’s the most Precious of them all. *smiles & winks* Precious is this weeks PhotoHunt challenge. Precious is a word that was meant for ME. Nothing in this condo could be more Precious than Moi. Yes, furrends, your eyes aren’t fooling you. TW chose to illustrate Precious with an image of Nicky chillaxing by the Christmas tree instead of yours truly. I’m so outraged, I may go on strike! I demand reparations! This must be made up to me under the Christmas tree! I want hundreds of gifts and treats waiting for me. Pfffttt on that! At least I know the entry in the Caturday Art Blog Hop hosted by Athena and Marie is a pic of ME. 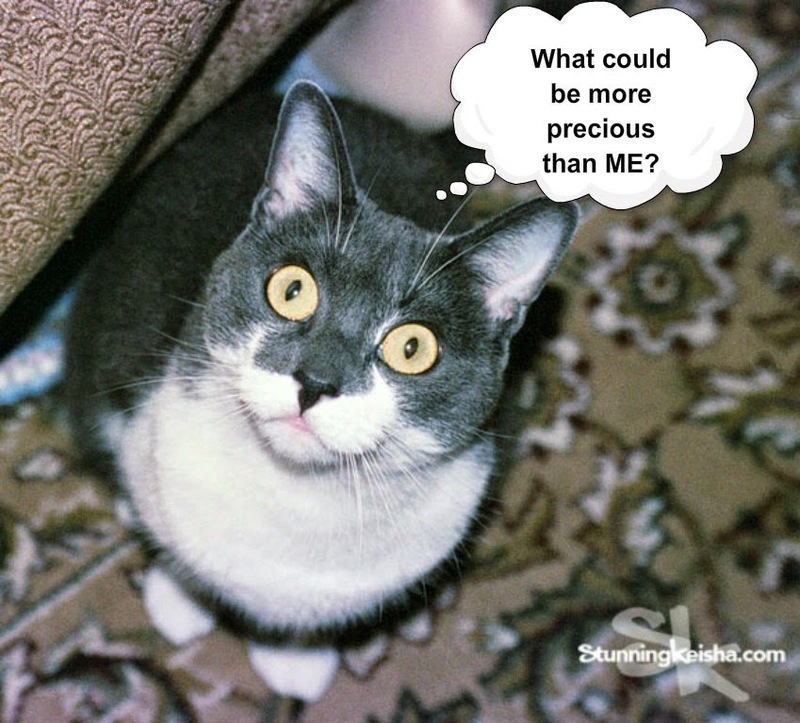 The art blog hop is a way for blogging cats to show our artistic, creative, boho side. If you click on the link above, you can see some other artistic pieces. But first check out mine. Heh heh. I sent out my first purrsonalized Christmas card (at left) in 2010. Nothing artsy or spectacular—just something TW made at Walgreen’s. It was our first attempt at a photo card. She didn’t know about places like Zazzle or Vistaprint or using high-quality images and type that you could actually read. Yet TW was proud of herself. The photo a blurry copy of a not blurry pastel drawn by the talented Joan Nardozzi aka zaziart. You can see some of Joan’s other work when you click on the link. Much of the work she does is of recently-departed pets that have been commissioned by one of the their friends. You can read more about her Random Acts of Kindness. Getting a beautiful portrait of someone you loved and lost seems to comfort those grieving. Her rates are very reasonable. I didn’t have to die to get my portrait done; I won it at a PawPawty. During the month of December, I’ll be showcasing some of my past Christmas cards. When my new 2014 cards arrive, I’m sure they’ll be pawsome. Thanks to all who have sent me cards. ♰ For those new to the blog: when I converse with TW, my words are italicized. You and Nicky are both precious :) Actually, my mother tells me often that Truffles probably thinks her name is Precious because I call her that so often! Sorry, CK... but Glogirly's hair stylist has a dog named Hannibal and a parakeet named Precious. ...so when we hear the word precious, we start thinking about a certain 'lamb' movie. Nicky are cute and all, but you shoulda been used to show precious. Definitely sums you up CK. Have a super Saturday. You are precious indeed CK! Oh, she also lives upstairs. Brian got momma laffing. Not sure why! Enjoy your day. Not much going on here in North Idaho except sleet. You are the most precious of all Keisha. Of course you are most precious CK, but Nicky has left TW with precious memories. And mes thinks that yous is adored too! If you look up precious in the dictionary there is a picture of you! I would not want to get on your bad side girl. We have our cards, but need the help of Mom Paula to get them mailed. You are very precious, especially with that tiny bit of pink lower lip showing. Mom LOVED your comment and so did I. You hit it right on the nail head. Taxes!! Nicky was precious, CK, but you are *extra* precious! I think that is a beautiful Christmas card!